Keep it traditional with glass pot brewing systems. If you’re looking for an inexpensive expensive brewer that still packs a punch, glass pot brewers will certainly give you more for less. Unlike single cup brewers or hopper-based systems, glass pot brewing systems require little maintenance or frequent service. There’s nothing wrong with sticking to traditional methods when it comes to brewers – if it’s not broke, don’t fix it! Like all Bloomfield brewers, the Bloomfield Koffee King Two Warmer In-Line Brewer is a proven, efficient brewing system with one of the lowest service costs in the industry. It has two warming station with porcelain enameled warmer plates that position decanters securely and will not scratch or scrape glass decanters. How do you get more for less? Us the Bloomfield Lo-Profile brewing system. At less than 17″ tall, the Lo-Profile is small in stature but big on capacity. 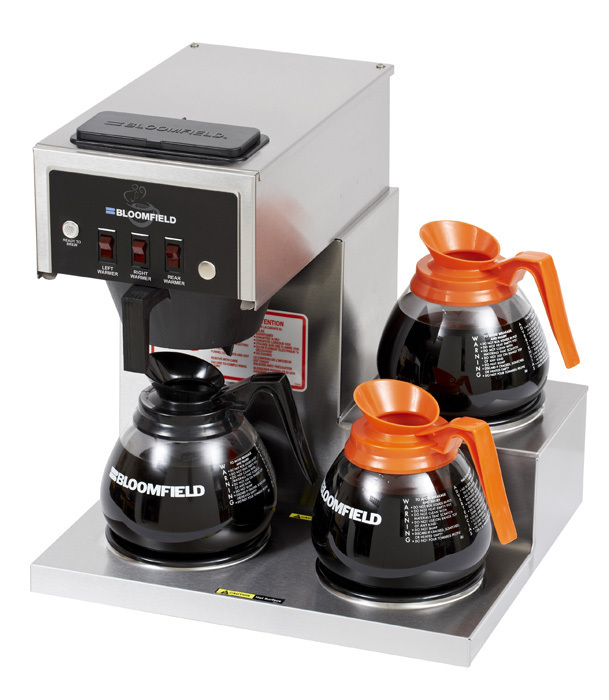 Like all Bloomfield products, this proven, efficient brewing system is designed to take advantage of the finest electrical components and has the lowest service cost in the industry.